Director Nathan R. Miles will be holding a reading for a potential AACTFest 2013 production. The reading will be Monday, September 24th, 2012 at 7 PM at the Playhouse. NOTE: This show has NOT been approved for performance, either for the 2013 season or for our entry into AACTFest 2013. It is a *potential* entry being considered. This is a reading for evaluation purposes only. 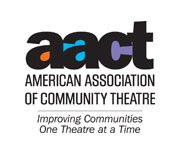 If you are interested in participating in AACTFest 2013, please come to the reading. Theatre companies advancing from the state level competition compete in the regionals. Those advancing from the regionals compete in the national competition. In 2011, the Community Players of Hobbs was the Alternate for the New Mexico AACTFest 2011 State competition, with the production of "Zoo Story", directed by Nathan R. Miles and starring Robert Schumacher and Nick Keele. Click here for more details on "Zoo Story" and our 2011 AACTFest experience. Audition notice "A Christmas Carol"